X3. A chair in 6 hours…. I sat in my chair at 4 minutes past 7pm and it didn’t break! It was a really good feeling and a great experience pushing my ‘bodging’ skills to the limit. 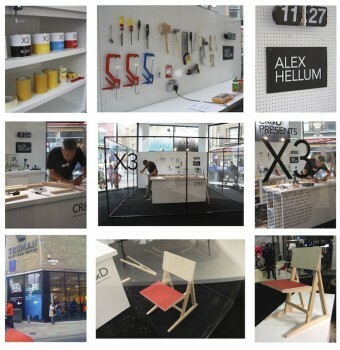 The x3 project was curated by CR&D who built a cube located in the corner of the glass fronted Truman Brewery, allowing not only public viewing from within the exhibition but also from Hanbury Street and Brick Lane. The concept was to ask 3 designer makers, the others being, Sam Weller and Jack Smith, to produce a chair each in 6 hours with limited tools and materials. 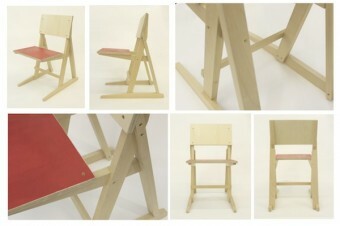 The Chairs are being auctioned on ebay with proceeds going to UK Youth. The project reminded me of a lecture I did called Pechakucha where you had 20 images and five minutes to present your work on stage. It makes you aware of the importance of knowing what you are about and being able to tap into that almost objectively. This project was a bit like that where you had a time-limit restricting your process and limiting your options of design and construction. Instead of calling the chair X3 I will call it 6H (6 hours) to recognise the true reason for its appearance and existence. I’m glad I did this chair it made me appreciate what’s possible under pressure.